The Detroit Vipers joined the International Hockey League in the summer of 1994. Palace Sports and Entertainment purchased the Salt Lake Golden Eagles franchise and relocated it to Michigan. The team played their home games at the Palace of Auburn Hills, and was an independent franchise for the majority of their existence. For the 1994-95 season, they were the parent club of the Colonial League's Detroit Falcons. Former Buffalo Sabres coach Rick Dudley was named the Head Coach/General Manager of the Vipers. Dudley had a successful run in the IHL, having led the 1987-88 Flint Spirits to the Turner Cup Finals and the 1992-93 San Diego Gulls to a league-record 62-12-8 and Finals berth. He was joined on the bench by future Flint Generals coach Robbie Nichols and player/assistant Mark Hardy. Dudley built a strong team with a mix of talented veterans and talented prospects. Vets like Hardy, Lonnie Loach and Rick Knickle were joined by future NHLers Miroslav Satan and Petr Sykora. Dudley's Vipers had an outstanding inaugural season, both on and off the ice. On the ice, they finished in first place in the Northern Division with a 48-27-6. Their 102 points were just two ahead of second place Kalamazoo and 18 points back of league-best Denver. Off the ice, the Vipers were an even bigger success. A combination of the NHL lockout, strong promotion and a lot of free tickets, helped the Vipers rewrite the attendance record books in the IHL. Detroit averaged a league-best 14,263 fans per game, often filling the 20,500-seat Palace. The team also had numerous games broadcast on Channel 38 in Detroit. Detroit had no problems lighting the lamp in '94-95, scoring 311 goals, fifth-best in the league. They were led on offense by Peter Ciavaglia, who scored 22 goals and 81 points. Ciavaglia would spend the remainder of his career with the Vipers. Daniel Shank, a mid-season acquisition from Minnesota, would lead the team with 44 goals. Lonnie Loach, acquired from San Diego, popped in 32 goals and 75 points. Jay Mazur was the other player with over 20 goals (23). Four others scored at least 15. The Vipers were also fifth-best on defense, allowing only 273 goals, only 37 behind league-best Denver. Dudley's main goaltender that year was Rick Knickle. Knickle played in 49 games, going 24-15-5 with a 2.99 GAA and 3 shutouts. Three other goaltenders were used that year: Norm Foster, David Goverde, Darren Madeley and Maxim Michailovsky. The Vipers drew the Kansas City Blades in Round One of the Turner Cup Finals. Kansas City finished in last place in the Central Division (35-40-6), but got hot at the right time. Detroit took a 2-1 series lead in the best-of-five series, but fell in five games to the Blades, including a 4-3 loss in Game Five at The Palace. I went to a lot of Vipers games over the years and have a ton of programs from that team. This program, from the inaugural game against Cleveland, is the only one I've bought on eBay. I have one from the last-ever Vipers game, so I figured I should have one from their first game. Other than the cover, it's pretty much the standard design for Vipers programs from that year. It's 88 pages, mostly black-and-white, but there are quite a few color ads. All the players from that year's team have their own bio, and there are stats for the 1993-94 IHL season and directories for each IHL franchise. Plenty of articles too, covering subjects such as that night's opponent to "The Trainer's Table". Very nicely-done program. I'll be putting Vipers programs from other seasons later. 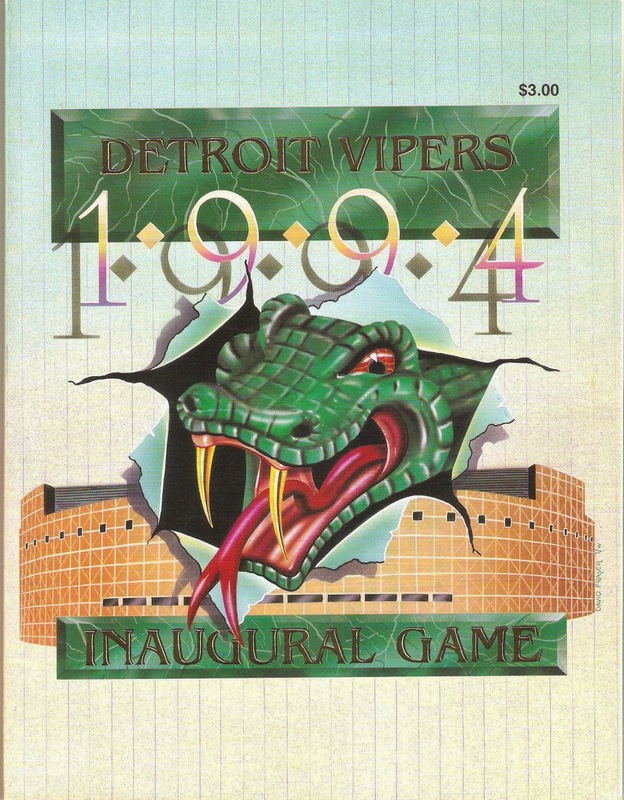 Detroit Vipers Inaugural Game Program, 1994-95.